To learn more about Dr. Sherman’s cancer path and the legacy that she is creating with her workshops and books, watch this video! The story: Healing on the levels of mind, body, emotions, and spirit. 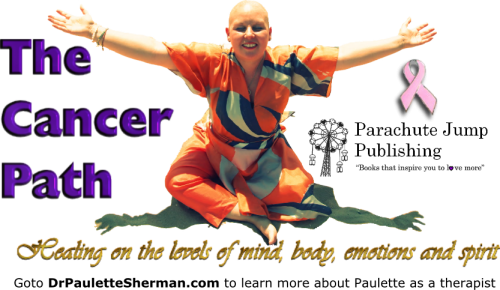 Dr. Paulette Sherman is a psychologist, coach, author and breast cancer survivor. In 2012 she was diagnosed with breast cancer and underwent surgery, chemotherapy and radiation for a year. She learned a lot from this experience about healing on the levels of mind, body, emotions and spirit and wanted to share this wisdom with other women going through this journey. 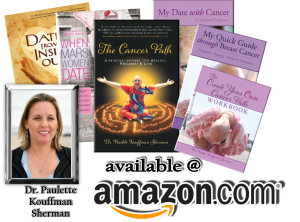 As a result, she wrote a 4 book series called The Cancer Path to help breast cancer survivors at different points along their path. She also does counseling, cancer coaching and tele-classes for people who want support. She practices out of Manhattan but is available internationally for phone coaching, media interviews or speaking engagements about viewing illness as a spiritual path. Please use the contact form if you are interested in counseling, coaching or speaking services. Author of The Little Book of Big Epiphanies andBald Courage. Author of The Silver Cloud Diet. Bestselling Author of Healing the Heart & Soul and You’re Not Going Crazy . . . You’re Just Waking Up! FREE The Cancer Path digital book now! 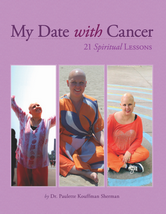 Sign up for Dr. Sherman's monthly newsletter now and get her digital book "My Date With Cancer: 21 Spiritual Lessons" NOW!